The Quietus | News | LISTEN: New Caught By The River 12"
LISTEN: New Caught By The River 12"
"This is the sound-story of an overnight sea-voyage that I and four others made one August, in an old open boat called Jubilee, to the Scottish Island of Sula Sgeir. Sula Sgeir – also known as the rock – lies far out in the North Atlantic. It is forty miles due north of the Outer Hebrides. It is the jaggy black summit of a submarine mountain, made of three-billion-year-old Lewisian gneiss. It is a shockingly severe place, home only to gannets, seals, skuas and puffin. And it is also the site each summer of a gannet hunt carried out by the men of Ness. "What Chris and I have wished to capture in this collaboration are those aspects of the journey that were experienced in the event as mood, tone or texture, and whose residues are with me still. I have wanted to evoke the abiding wonder of sailing that old boat up that ancient sea-road into that vast and lonely ocean, with Jupiter bright in the sky and a glowing wake of phosphorescence unfurling behind us. "What follows, therefore might best be imagined as a dream-voyage or wonder-journey: what in Gaelic is called an Immram. In this sense precedents for it might be found in early Celtic sea-stories- the lyric accounts of Mael Duin or St Brendan, say, sailing their hide-hulled boats westwards and northwards, passing out of the verifiable and into the miraculous." 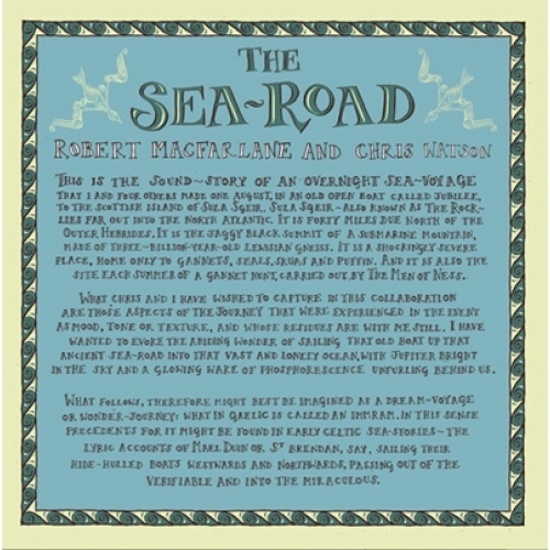 It's available on 12" vinyl - get hold of a copy here - backed with two more tracks by Watson, a founder member of Cabaret Voltaire, 'Granite' and 'Stormbeach', and with cover art by the illustrator Nick Hayes, who published his graphic novel of Coleridge's 'The Rime Of The Ancient Mariner' last year. It follows the previous Rivertones release, 'Under Dubwood', an ace mesh of Richard Burton's narration of Dylan Thomas's 'Under Milkwood' with a King Tubby dub track.